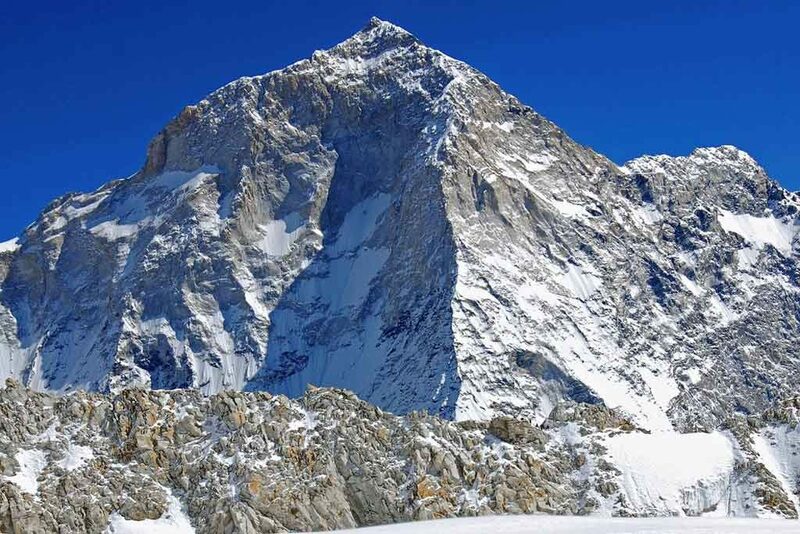 Makalu (8,463m/27,767ft), the fifth highest mountain on the earth lies in the Makalu-Barun National Park. This remote terrain stretches east from the Sagarmatha National Park; between the high plateau of Tibet and the deep subtropical gorge carved by the Arun River. So, Makalu Base Camp trek is one of the remotest and adventurous treks in Nepal. The wide range of pristine ecosystems and also diverse cultures have made Makalu trek more classical. Sherpa, Rai and Limbu people are the main settlers in this area. 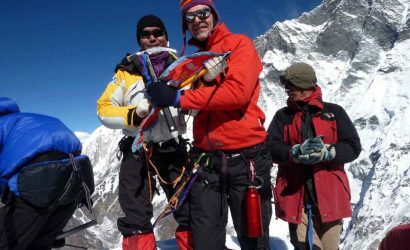 The spectacular views of rocky Himalayan peaks including Makalu, Chamlang (7,319m/24,013ft), Baruntse (7,129m/23,390ft) and the complete panorama of Everest and Lhotse are some highlights of Makalu Base Camp trekking. With very few modern facilities and amenities, the trek to Makalu Base Camp needs a well-supported team with sensible equipment. This unique landscape shelters some of the rare species of animals and plants of Nepal. More than 3,000 species of flowering plants, 440 species of birds and 75 species of mammals, including the endangered Clouded Leopard, Red Panda and Musk Deer have been recorded in this area. Therefore, this remarkable biodiversity draws a great consideration to be the living laboratory for scientific study. Makalu trek becomes a wilderness trek with an extension of the highest passes, Sherpani Col (6,100m/20,014ft) and West Col (6,135m/20,129ft), also known as Ice Col Adventure trek. Fly Kathmandu to Tumlingtar (457m/1,500ft) and trek to Khandbari (1,040m/3,412ft). We take an hour flight to Tumlingtar where we meet our trekking crew and have a short briefing on the trek up to Khadbari. We will have lunch in the shade of Kabra Trees. We walk north towards Khandbari on a plateau for a while after which the trail begins climbing gradually to Khandbari. We stay overnight here. Trekking time 3-4 hours. Trek Khandbari to Chichila (1,920m/6,300ft). After breakfast we walk through many picturesque small villages, most of the walk is uphill and is through bamboo groves and a rhododendron forest. Our camp is at Chichila which is a small settlement of Gurung tribe. Trekking time 5-6 hours. Trek Chichila to Num (1,490m/4,888ft). Today we start walking with views of snow capped peaks in the distance with fantastic views of Makalu and the surrounding peaks. We then take a straight path with little ups and downs, through a forest. We stop for lunch after about 2 hours. We then start descending to reach Num. Trekking time 5-6 hours. Trek Num to Seduwa (1,510m/4,954ft). Today the trail descends steeply from Num through the cornfield at Lumbang. The country is particularly rocky with tiny terraces planted with corn and barley. We have a tough, steep climb to Seduwa. Trekking time 5-6 hours. Trek Seduwa to Tashi Gaon (2,070m/6,791ft). The trail crosses meadows and several streams and then climbs to the Sherpa village of Tashi Gaon the last permanent settlement in the Makalu valley. Trekking time 5-6 hours. Trek Tashi Gaon to Khongma (3,470m/11,385ft). Today’s trek is very hard as the trail is steeper. We walk through the sparse forests along the ridge over a hillock and take a short descent to Khongma. Trekking time 6-7 hours. Trek Khongma to Mumbuk (3,400m/11,155ft). We again start today with a steep climb then through less steep rhododendron forests to the top of the ridge where we will have superb views of Chamlang (7,319m/24,013ft). We then continue through a forest of firs and rhododendrons to Mumbuk. We cross Shipton la pass (4,800m/15,749ft) and Keke la pass (4,127m/13,540ft) today. Trekking time 6-7 hours. Trek Mumbuk to Nghe Kharka (3,750m/12,303ft). Today the trail descends a steep gully with a stream for about 500 meters. The trail is ill defined and rocky with sloppy mud in places as it leads up the glacier valley. Nghe Kharka is located on a large open grassy plain where we can have the great mountain views. Trekking time 6-7 hours. Rest and acclimatisation day at Nghe Kharka. Nghe Kharka is a pilgrimage site for local people. We stay for two nights at Nghe Kharka for acclimatisation. Trek Nghe Kharka to Shershong (4,615m/15,141ft). Today the trail turns westwards and leaves the rhododendron forests for alpine tundra. There are excellent views of Pyramid Peak (7,168m/23,518ft). We gain sharp elevation today. Trekking time 7-8 hours. Trek Shershong to Makalu Base Camp (5,000m/16,404ft). Today is a gradual climb to a minor pass, about 100 meters. From here you will have magnificent south face views of Makalu also you will be able to see the complete panorama of Everest and Lhotse. Trekking time 4-5 hours. Return trek Makalu Base Camp to Nghe Kharka. We retrace our steps back down the Barun Valley after exploring Makalu Base Camp. Trekking time 7-8 hours. Return trek Nghe Kharka to Mumbuk. Today we continue descending back. Trekking time 5-6 hours. Return trek Mumbuk to Khongma. We trek across Shipton la pass (4,800m/15,749ft) and Keke la pass (4,127m/13,540ft) and descend to Khongma. Trekking time 5-6 hours. Return trek Khongma to Tashi Gaon. Today’s trek is quite long as we retrace our steps to Tashi Gaon. Trekking time 5-6 hours. Return trek Tashi Gaon to Seduwa. We walk through farming settlements to the village of Rai which is spread out. We then continue through forests and past several streams. Trekking time 4-5 hours. Trek Seduwa to Bumlingtar (1,160m/3,806ft). Today’s trek takes us through the Sal and broad-leaved forests, cultivated fields and follows some spectacular high and exposed narrow tracks as it climbs over rocks. We camp at the Chhetri village of Bumlingtar. Trekking time 6-7 hours. Trek Bumlingtar to Tumlingtar (457m/1,500ft). Today we follow the east bank of the Arun River and the route through Chyawabesi before reaching Tumlingtar. Trekking time 6-7 hours. We take an hour breathtaking flight from Tumlingtar.